Let's get this out of the way. There are two kinds of people: The people that will LOVE this cookbook and the people that will HATE this cookbook. It is easy to be polarized. Nathan Williams is the editor of the widely popular magazine, Kinfolk. LOVERS: The magazine's goal is to "offer an alternative idea of entertaining -- casual, intentional, and meaningful." HATERS: Kinfolk entertaining is tortured, pretentious and devoid of people. LOVERS: Nathan Williams is a world traveler, collecting recipes. HATERS: If your world is Portland, Brooklyn, Copenhagen, and the English countryside. LOVERS: The recipes are simple and elegant. HATERS: The recipes are tedious and don't work. We read dozens of reviews of this book. The glowing reviews all said the book was gorgeous and published a slew of pictures. They waxed poetic about the food, but no one had actually made any of the recipes. The only actual review of the book we could find came from Felicia Sullivan in Medium. She was not a fan. LOVE IT: If you have ever picked up or for that matter, seen a copy of Kinfolk, you cannot miss it. It is visually arresting. There are few publication out there that one can spot at 100 feet. They love white walls and wooden tables and roasted chicken and so do we. They don't care about immersion circulators or stick blenders or matched china. It is beautiful and we want it for that reason, alone! HATE IT: We love our white walls and wooden table, but we would spend an entire day setting up these photos. They are not just thrown together, they are highly curated. For all the talk of "gatherings" and "community" the photos are hauntingly devoid of people. Most people are alone. The "simple" food is reminiscent of hippie cookbooks from the 1970's. So, in bringing "entertaining" to a new generation, they seemed to have brought mama's old commune coobooks with them. Rinse the lentils under cold running water in a fine-mesh sieve until the water runs clear. Place the lentils in a medium saucepan and add enough cold water to cover by 3 inches. Bring to a boil, then reduce the heat to medium-low, cover and simmer for 20 to 30 minutes or until the lentils are tender. Drain the lentils and return them to the pot. Add enough cold water to cover by 3 inches. Remove and discard any lentil shells that rise to the top, then drain once again. Place the lentils in a large bowl and add the scallions, olive oil, vinegar, lemon juice, zest, sugar, and salt and pepper to taste. Let the salad rest for at least 20 minutes to allow the flavors to combine. Serve. The salad can be stored,refrigerated, in an airtight container, for up to two days. 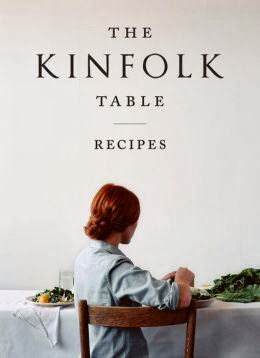 The Kinfolk Table is an aspirational cookbook. You aspire to lovely blonde and African children. You aspire to copper pots and a house filled with books. You aspire to poached salmon and steamed cod. You aspire to tattoos and bearded boyfriends in Portland or Brooklyn. Right now I am sitting at my reclaimed wood table, staring at my stark white wall, drinking coffee, alone. I aspire to the pages of Kinfolk, but I am not going to get dressed or clean off the table for the photo shoot! Ha ha, put me in the haters category. I've been drinking out of mason jars since I moved into my first apartment in 1991, I just cannot get on board with these people.